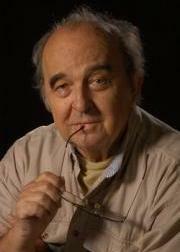 Graduated from the Janáček Academy of Music and Performing Arts in the year 1953, engagements: Slovácké Theatre, Uherské Hradiště (1953), Theatre of the Brothers Mrštík (1956 – 1966), Theatre of E. F. Burian, Prague (3 months in the year 1966), Brno State Theatre (1966 – 1967), since 25.7.1967 at Brno City Theatre. He has happy memories of these roles: Trepifajksl (Dalskabáty), Jehan (Balada z hadrů - Ballad from Rags), Knejp (Lumpacivagabundus), Sadílek (Svatba pod deštníky – A Wedding under Umbrellas), Magis (Vajíčko - The Egg), actor Bendl (Válka vypukne po přestávce – War Will Break Out after the Intermission), Vicar (Nanebevzetí plukovníka Heiliga – The Ascension of Colonel Heilig), Ferdinand (Slaměný klobouk - The Straw Hat), Tartuffe (Tartuffe), Falstaff (Veselé paničky windsorské - The Merry Wives of Windsor), King Henry II. (Becket), Michael Leon (Jimmy Shine), Damianos (Nejkrásnější válka - The Most Beautiful War), the Duke of Milan (Dva šlechtici z Verony - Two Gentlemen of Verona), Sancho (Muž z kraje La Mancha - A Man of La Mancha), Amos (Chicago), Karel Veliký (Pipin), Gérald (Žena roku - Woman of the Year), Josef Novák (Divotvorný hrnec - Finian’s Rainbow), Mayor (Návštěva staré dámy - The Visit), Dr Galén (Bílá nemoc - The White Disease), Vicar Zachar (Noc pastýř - Night of Shepards), Lišák Pseudolus (Lišak Pseudolus - Pseudolus), Jeppe (Jeppe z vršku - Jeppe of the Hill), Caesar (Caesar and Cleopatra), Maxmilián Lampa (Teta z Bruselu - Aunt from Brussels), Claude (Krvavá Henrieta - Bloody Henrietta), Nejezchlebos (Osel a stín - Donkey and the Shadow), Hauk-Šendorf (Věc Makropulos), Gajef (Višňový sad – The Cherry Orchard), Caesar (Julius Caesar), Major (Mamzelle Nitouche), The Doge of Venice (Othello), Professor (Monsieur Amédée), Sarka Farka (Hrátky s čertem - Playing With the Devil), Escalus (Romeo and Juliet).